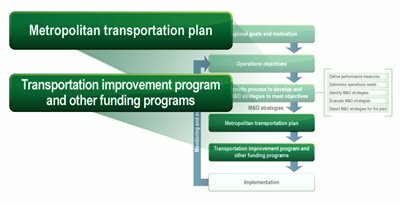 Goals and measurable objectives that advance operational performance outcomes of the regional transportation system. Performance measures that allow the region to track progress toward achieving its objectives. Clearly defined M&O strategies backed by specific performance measures that allow for evaluation. MTPs should discuss M&O strategies that are funded by State, regional, and local transportation agencies, even without Federal funding involved. Since many M&O strategies (e.g., incident clearance, emergency response) are planned and executed by these types of agencies, this discussion would provide a more holistic picture of the M&O strategies being employed within a region, which will provide a clearer picture of the entire transportation system and its performance. Development Fees: New developments pay pro rata share of the costs of transportation improvements necessitated by the impact of the development in Montgomery County, Maryland. Private Traffic Reporting Company: A Tucson, Arizona traffic control center receives personnel services and advertising time in exchange for traffic information. A section focused specifically on M&O. This section of the plan would identify M&O goals, include specific, measurable, regional operations objectives, and describe how M&O strategies achieve stated objectives. This section might describe existing system performance, project system performance in absence of the plan, and expected performance with the inclusion of all planned M&O projects and strategies. Alternately, a resulting MTP could include discussion of M&O strategies within the context of different goals and strategies identified within the MTP. For example, a goal aimed at improving highway safety might utilize a regional operations objective related to reducing the number of fatalities on the highway system, and include M&O strategies such as emergency response teams, enhanced signalization, etc. A goal aimed at improving mobility and access across the region might include a regional operations objective related to reducing the level of traveler delay, and include M&O strategies such as peak-period use of shoulder lanes, congestion pricing, and variable message signs. Transportation management and operations is an integral part of many regional goal areas such as homeland security, environment, safety, and livability. In the Baltimore, Maryland region, the MPO – the Baltimore Regional Transportation Board (BRTB) – has worked to advance emergency preparedness and related transportation operations activities. Since September 11, 2001, the BRTB's committees have expanded their collaboration with emergency responders to all hazards including acts of terrorism. One of the BRTB's committees, the Transportation & Public Works (T&PW) Subcommittee, also reports to the Urban Area Homeland Security Work Group (UAWG). The UAWG, which is a stand-alone regional committee, allocates the U.S. Department of Homeland Security’s Urban Area Security Initiative (UASI) funds to the region. The T&PW Subcommittee requested and received UASI funds from the UAWG for several projects that support planning for transportation management and operations during emergencies. One project involves the development of an evacuation model that will provide emergency responders with recommended evacuation zones and routes given the location of the incident, recommended signal timing and turning movement restrictions, and estimated evacuation clearance times. While designed for emergencies, this model can also be used to support transportation management during other types of events. UASI funds have also been used to develop a decision-support tool for identifying routes that would be most appropriate for contraflow operations and would warrant further study and analysis. Also, the T&PW Subcommittee used UASI funds as well as transportation funds to conduct a transportation-focused evacuation tabletop exercise in the spring of 2010. The Pima Association of Governments (PAG) led a group of operations participants in identifying specific objectives and performance measures for arterial management, traveler information, and work zone management to develop a regional concept for transportation operations. These objectives guided Tucson's selection of management and operations strategies and the approaches for implementation. The regional concept for transportation operations (RCTO) group identified specific operations projects and programs such as a regional traffic signal program to be included in the PAG TIP and funded through a half-cent transportation sales tax, which passed in 2006. The Regional Transportation Plan (the Plan) developed by the Regional Transportation Commission of Washoe County is organized by mode of travel and contains goals, measurable objectives, performance measures, and transportation improvement strategies across several plan areas including congestion, condition, safety, and air quality.24 There are six overall goals that guide the Plan's implementation. The goal with the strongest element of operations is "Manage the transportation system to provide an optimum level of mobility for the greatest number of persons while insuring mobility for the transportation disadvantaged." The goals, objectives, policies and performance measures also are discussed with each mode, while M&O strategies are discussed primarily in the chapter titled "Transportation Management/Intelligent Transportation Systems Element." Average per capita daily travel time will not increase above 2000 levels more than 20 percent by 2008; 30 percent by 2018; and 40 percent by 2030 and beyond. Within Bus Rapid Transit (BRT) corridors, the BRT mode share will be 20 percent by 2020 and 30 percent by 2040 and beyond. All signalized intersection will be within policy level of service by the year 2012 and maintained at that policy level of service thereafter. The Plan notes that during the RTP update process, the progress toward the objectives will be reviewed and objectives and activities will be updated as necessary. The Denver Regional Council of Governments' 2035 Metro Vision Regional Transportation Plan has several focus areas, such as freight, security, and safety, including one that is dedicated to system management and operational improvements.26 The overall objective of this focal area is "to provide more reliable travel times and reduce the amount of delay faced by drivers, passengers, and trucks on the roadway and transit system." Strategies identified in the plan include providing queue jump lanes for transit, disseminating real-time information to travelers on travel time/speeds on VMS and websites, and coordinating traffic signal timing plans across jurisdictions. More importantly, "management, operational, and air quality improvements" is a major system category with designated funds in DRCOG's plan. Clearer links between the MTP and the TIP, which often includes short-term projects focused on operations. An MTP may identify funding sources that can be set aside for projects that will be selected in more short-range planning analyses to address congestion and reliability issues. By clearly articulating regional goals and objectives, this can help to ensure that infrastructure projects in the MTP have a clearly identified purpose and need. 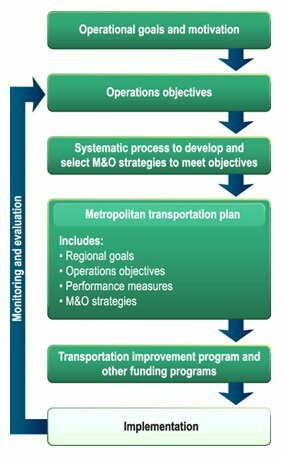 Since the approach places increased attention on M&O strategies, it will inherently involve stronger consideration of transportation system management alternatives to projects. By considering M&O strategies in connection with infrastructure projects, this may help to shape project decisions as the project moves from planning through project development and design. For instance, as part of any new highway expansion, M&O strategies such as the deployment of enabling technologies (i.e., ITS), transportation pricing, development of high-occupancy vehicle lanes, or flexible design to accommodate concurrent flows of traffic can be put forward and incorporated into the proposed project alternatives. Improved ability to meet customer needs in the short-run and long-run, rather than just focusing on long-term needs. Improved ability to meet a range of regional goals, as M&O strategies help to address safety, security, mobility, recurring and non-recurring congestion, and other issues. 23 Information on funding for operations can be found in Show Me the Money: A Decision-Maker's Funding Compendium for Transportation Systems Management and Operations, U.S. Department of Transportation and the National Transportation Operations Coalition, FHWA-HOP-06-003, December 2005. Available at: http://www.narc.org/uploads/File/Transportation/Library/Trans_Funding_PTI_FHWA_2006.pdf, last accessed December 6, 2009. 24 Regional Transportation Commission of Washoe County, 2040 Regional Transportation Plan. Available at: http://www.rtcwashoe.com/planning-7, last accessed March 1, 2010. 26 Denver Regional Council of Governments, 2035 Metro Vision Regional Transportation Plan. Available at: http://www.drcog.org/index.cfm?page=regionaltransportationplan(rtp), last accessed December 6, 2009.